We didn't just want to list all the leather we have. We thought we'd make it a bit more fun for you in a little 'game'. This game first appeared on our website 10 years ago and it has been a hit ever since. We were inspired by the those flipbooks of our childhood. You must know those little books with which you can design your own creatures by turning pages cut in three, and combine head, body and legs. 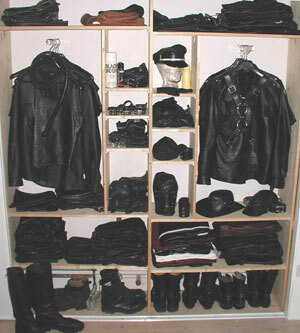 In our version you can have L or M wear any combination of leather or rubber you desire!